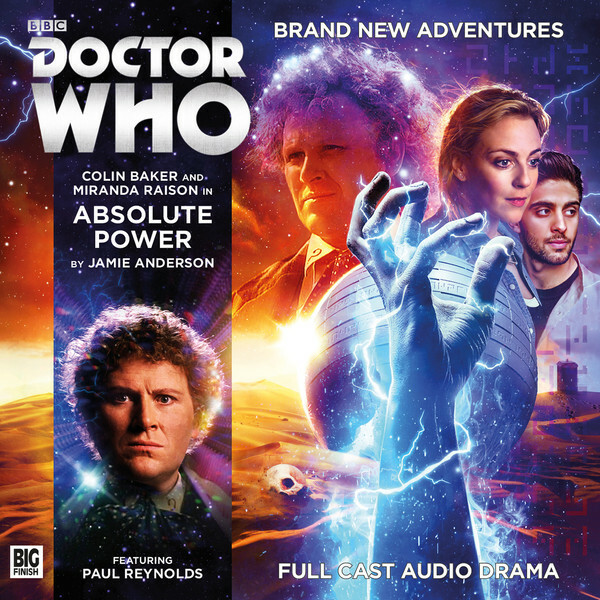 Big Finish: Doctor Who - ABSOLUTE POWER Review | Warped Factor - Words in the Key of Geek. There are stories with a broad appeal across the fandom, and then there are stories into which you pretty much need to be pre-tuned in order to get the most out of them. Absolute Power is the second kind of story. On the surface, it’s all alien archaeology, double crossing characters, a MacGuffin of Absolute Power – power on this occasion in the sense of the stuff your electricity company charges you through the nose for – and a mysterious AELE, or Anomalous Extinction Level Event, which wiped out the natives on Teymah, the planet being excavated. There’s a rule in the theatre that goes by the name of Chekhov’s Gun. It states that if you introduce a gun into the storyline in Act 1, someone must have fired it by Act 3, otherwise you’re falsely advertising the potential solution, or the potential conflict, of the gun. Doctor Who is no stranger to Chekhov’s Gun, but it’s probably never been quite as blatantly deployed as it is in Jamie Anderson’s script here. There’s an empathic doohickey that the Doctor’s been tinkering with for many regenerations, that just happens to come to light and be finally finished as this story starts. You can bet your last Altarian dollar that by the end of the story, the Doctor’s going to vitally need an empathic doohickey in order to come out on top – and you can safely make the bet as soon as you first hear about the doohickey in question, within the first few minutes of the story. There are a couple of really classically hokey Sixth Doctor cliff-hangers in this story – perhaps not quite as naff as ‘I really think this could be the end,’ but close, including one old-fashioned bait-and-switch ‘Oh no, the companion’s just been blown to smithereens… oh, no they haven’t.’ And the whole thing is studded with elements that make you want to rip it apart – one of the leading protagonists in the story is named ‘Lyam Yce – no “I,”’ his girlfriend is so simperingly wet and ditzy, it undermines any sense of surprise when you discover she’s not that at all, but is…something else entirely. The under-plot which explains why one of the richest tech-giants in the cosmos is excavating a planet where everybody mysteriously died feels surprisingly slight for something that takes up as much time as it does, and the ending, with the two different species trying to exterminate each other, while intending to be a fascinating debate on the rights and wrongs of conflict, ends up seriously threatening the likelihood that you’ll care very much either way. That said, none of it is particularly badly done – with perhaps the exception of the heavy-handed Chekhov’s Gun deployment. It’s an involving enough way to spend a couple of hours, and it evokes some geek lore, by being a sort of alien Quatermass, with a big hole being dug, a big cryptographic riddle to be solved (Constance’s skills being somewhat forcibly deployed here to remind us she’s not just a companion of the Doctor’s), and a big techno-bauble at the heart of the mystery, which could be one thing, could be another, turns out to be a bit of both and something entirely else again… As we say, there’s plenty here to keep you entertained, and the actors too deliver what’s on the page with conviction too, Jenny Bede as Florrie the wet girlfriend impressing in particular. It all just feels a little (and this is an odd word to use) intentional, as though Anderson’s gathered together a bunch of elements for the express purpose of telling a Doctor Who story. That’s usually the case of course, but here it feels a little more unfinished and obvious than usual, which makes the questions of conflict and the rights and wrongs of exterminating another species lose some of their ability to affect us in this setting. The emotional heart of the story works better though, and is rooted in Constance and a factotum by the name of Ammar (played by Adrian Nik). That affects us because it uses all the rest of the story’s goings-on as background to get the pair to do things, to advance their understanding or get them out of danger, and so forges a bond between them. It’s a tender element in a story that frequently feels like it’s otherwise going on without much by way of points of connection, and Ammar’s devotion to Constance, his determination to do things for her, to prove himself to her is both touching and sad, especially because it shows Constance as what Quicksilver, the story that follows on from Absolute Power, eventually reveals her to be – generally obedient to the mores of her class and culture, but relatively inexperienced in the ways of the heart. She ‘manages’ Ammar in this story, encouraging him to do the things he does to prove himself to her, but remaining out of reach emotionally, whether entirely because of her commitment to her husband back home or not we’re not entirely sure. Bottom line, Absolute Power’s not a particularly difficult listen by any means, but unless you’re predisposed to the kind of story it is (lots of people deceiving each other, fairly standard alien conflict underneath, misguided businessman in the middle, looking for a payoff), it might be an also-ran in your collection, one to pick up along the way rather than one to drop everything and listen to immediately.